You'll find accommodations at the Holiday Inn Express Hotel & Suites packed with all of your travel needs. 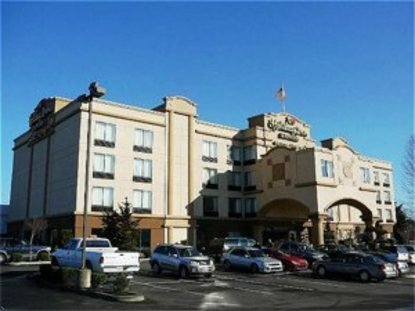 This Tacoma hotel is located just minutes from Fort Lewis, McChord AFB, Pacific Lutheran University, Tacoma Convention Center as well as major industrial parks. We are also conveniently located near exciting attractions including the Tacoma Dome, Sprinker Recreation Center, Puyallup Fairgrounds, and Tacoma's Glass Museum. Guests travelling on business appreciate our convenient location directly off of Interstate 5. Our friendly staff are eager to assist you with directions or recommendations to any location, including many great restaurants, museums, parks, theatres and shopping centers. We recently completed a luxurious renovation and invite you to come enjoy a relaxing stay with us All of our rooms are non-smoking and complete with microwaves, refrigerators, high speed Internet and even 37" LCD televisions You are sure to wake up rested and refreshed with our wonderful pillowtop mattresses featuring the Simply Smart Bedding Collection. Start off your morning enjoying our deluxe Complimentary Express Start breakfast featuring our signature cinnamon rolls, omelets with bacon as well as many other wonderful favorites. Stay Smart at the Holiday Inn Express Hotel & Suites in Tacoma This hotel is committed to providing accessible facilities under the American Disabilities Act. If your accessibility needs are not met, please contact the Hotel Manager on Duty. Should you require additional information regarding accessible facilities for guests with disabilities, please call 1-800-Holiday (U.S. and Canada) or contact the hotel directly. For the hearing impaired, TDD service is available at 1-800-238-5544 within the U.S. and Canada.